We`ve been making our way north along the western side (ish) of this `ere continent... and wouldn`t you know it - we`ve finally arrived on the Caribbean up here in the North of Colombia. Its hot, humid and just plain delightful. Some highlights along the way? 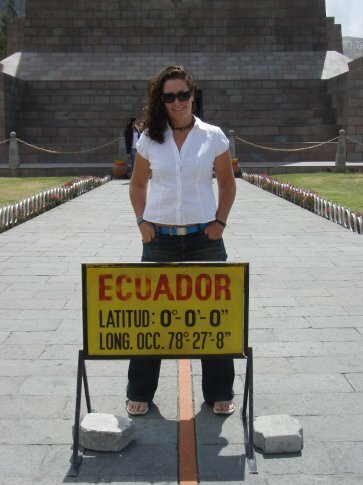 Well - we crossed the Equator. Its all a bit gimicky with a tourist park set up and all - but who can resist the fun of jumping from the Northern to Southern Hemisphere? And back again :-) Getting there involved conquering the Quito bus and trolley public transport system too - which is always an adventure. The old historic centre of Quito is really a lovely city. But given our miniscule attention spans... the museums didn`t hold us long. What really entertained us was the pedestrian crossing traffic lights. Yup. You see theres this little green man who starts walking the funkiest little hip-hopster kinda walk... but as his time ticks down he goes faster and faster until the funky little dude is sprinting to the finish before the big bad red light takes over. Cool. My extremely accurate impersonations were not appreciated by Ben. Sigh. Time came for another country change. So up we headed for the Colombian border. Various stories and rumours about border crossing security and searches and the like - had us approaching the border somewhat anxiously. But you know what - we left Ecuador - had a hot dog and entered Colombia. Then realised all the taxis to the nearest Colombian town were actually back over the other side of the border, so strolled back and got ourselves a taxi. So there may have been dudes with big guns all around the place but I think we did a pretty damn good job of bamboozling them with our dumb gringo act. Colombia... we have arrived. The trip up to Bogota was pretty straight forward. Mind you - the bus did stop at one stage and we all filed off to show the police dudes with machine guns our passports. I noticed a few guys being frisked and naturally grabbed the camera out ready for when it was Ben`s turn but dagnabit if our dumb gringo act seemed to be carrying over and we were let back on the bus without so much as a pat-down. Bogota has claimed the honorable title of our favourite South American City so far. Truely couldn`t tell you why except to say it had a great vibe. Funky bars and cafes, some incredible old buildings, tops people and... well... a great vibe. We had fun. Managed to drag oursleves away from Bogota and have made the 20hr bus haul up here to Cartagena. Stepping off the bus after 20hrs it may as well have been stepping off a 20hr flight. It truely is like we´ve landed in another whole world. The hot hot hot steamy air for one thing. But everything here just feels... well Caribbean. Different people, music, atmosphere and all the rest of it. Calls for some serious exploring if you ask me. Time now, then - to step out into the steamy streets and see what new fun we can discover. 1.How long did it take you from Quito to Bogota, and what was the ticket price? 3. And the bus to Cartagina - is it really so dangerous, or for americans only? Thanks in advance, Alexey from Russia. Hey :) what bus did you take from bogota to cartagena? ?